Moles do not eat your plants or plant roots like gophers, they do not rapidly multiple like mice or rats, and they do not eat your grass like voles. In fact, unlike rodents, moles are insectivores that many gardeners choose to share their gardens with in order to enjoy their beneficial qualities. Moles constantly tunnel beneath the surface, which turns and aerates the soil. They dine on insects and grubs, which helps control the insect population, and they do not eat your plants or roots, which means the damage they do is largely aesthetic. This means that the disruption of root systems can cause your grass blades to turn brown and the tunneling can cause raised mounds of dirt to dot your yard, but they generally are not causing any real damage to your property. 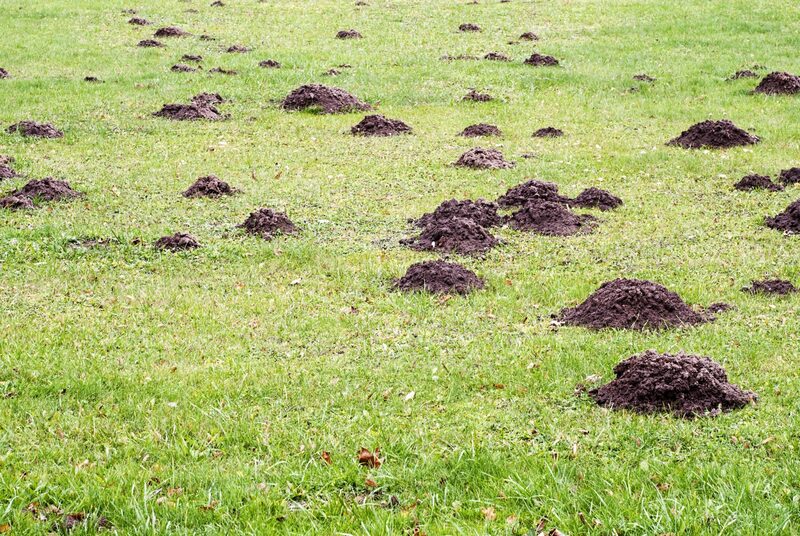 This, of course, does not mean that you should simply let them crisscross your lawn with raised trails, and it should be noted that a single mole can cause considerable aesthetic damage. For example, moles will sometimes use a tunnel only once before digging another one. Plus, rodents may use the left-behind tunnels they create, so this could result in an increase in the rodent population on your property. Since moles are solitary animals, you likely only have one or two moles on your property. The exception would be if you have a new mother who just gave birth to a litter, since her pups will stay with her for a little over a month before heading out on their own. If your mole has a litter, this will likely be in late spring, since spring is when they mate. Mating season is really the only time they spend any time above ground. Other than that, they spend nearly their entire lives below the surface. If you have a mole problem and do not want to use lethal or toxic measures, such as traps or poison, your best mole removal option is to make your yard less appealing and encourage them to move on to more welcoming land. 1. Create barriers with buried wire mesh. Dig down at least two feet below the soil surface along your fence line, around your garden or lawn, or in other spots where you want to deter moles. Once you have dug your trench, bury hardware cloth or another sturdy, wire mesh a foot below the surface to help keep moles from entering your yard from neighboring properties. 2. Create barriers with gravel. As an alternative to wire mesh, you can also fill a two-foot trench with gravel to create a protective border around lawns or garden areas. 3. Use live traps and relocate the moles. Since you likely only have one or two moles hanging around, this might be the easiest way to get rid of your moles without killing them. Deploy live traps and check them often. 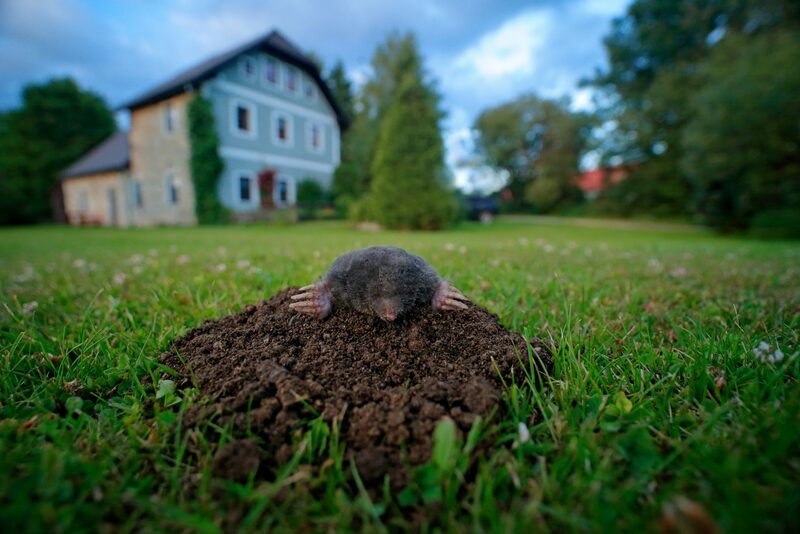 Once you have trapped a mole, carefully take the trap to a distant locale and release the mole. 4. Remove their food source. Moles love grubs and grubs love lawns. So, if your lawn has grubs, you are at higher risk of having moles move in and destroy your natural grass. Milky spore or beneficial nematodes are two options for reducing the grub population in your yard, which, in turn, can reduce your mole population. Moles also eat insects and earthworms, but earthworms are good for your soil, and you do not want to kill them or remove them. Because moles have food sources other than grubs, simply removing grubs will probably not take care of your mole problem. Therefore, like most natural methods, this should be used as part of a multi-pronged approach to mole removal. You should also consider that killing grubs may result in your mole eating more earthworms, which is not good for your soil. Deter moles from getting comfortable in your yard with ultrasonic repellents designed to ward off moles and rodents. Moles spend almost their entire lives underground, which makes ultrasonic repellers that emit ultrasonic vibrations more effective for moles than they are for various types of rodents. 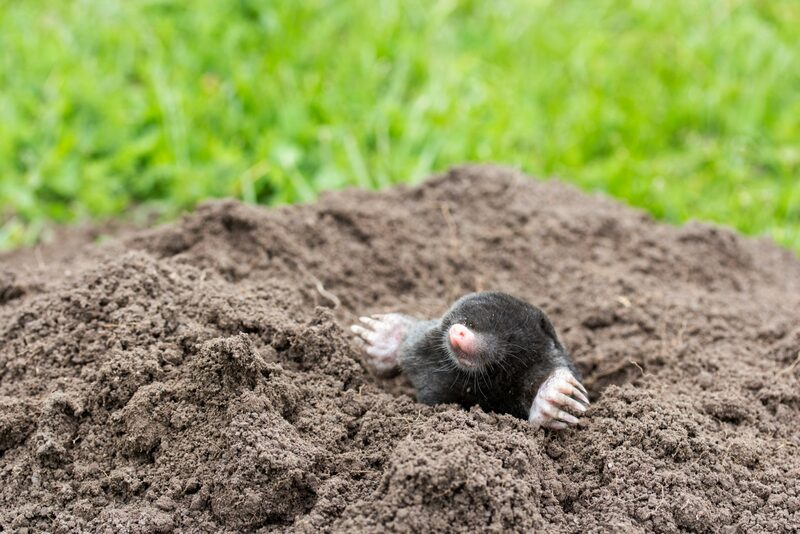 You may find that your moles simple tunnel in other areas of your yard farther away from your ultrasonic repeller, but that might be all you need if you are looking for something to keep moles away from your lawn or outdoor living areas. You can purchase ultrasonic mole spikes online or at some local garden centers. 6. Deploy castor oil pellets or sprays. There are several non-lethal, commercial mole removal products made with castor oil. These are generally pellets or sprays to be used at entry points in mole tunnels. Since castor oil is poisonous, make sure you do not use castor oil-based products in areas where pets or children spend time. 7. Incorporate mole-repellent plants into your landscaping. Plants that repel moles, such as Narcissus, marigolds, daffodils and ornamental alliums, are an easy addition to your mole removal efforts. This type of natural mole removal often is not effective when used on its own. You will have greater success if you combine several natural methods for mole prevention and removal. 8. Ward off moles with pet waste. When you scoop your cat litter box or pick up dog poop around your yard, place some at the entry points of moles’ tunnels. This is not the best-smelling method for mole removal, but it is a natural option. 9. Encourage owls to take up residence on your property. Install one or more owl boxes on your property to encourage owls to spend more time in your yard. This is more effective for rats, mice and gophers that spend more time aboveground, but it can be effective for removing moles, particularly in spring when they surface to mate. 10. Disrupt their sense of smell. Like rodents, moles use their sense of smell to seek out food and know when a predator is nearby. Because of this reliance on their sense of smell, moles and rodents do not like to hang out in areas with strong odors that can make it difficult to smell food and predators. Aromatic mole removal options include coffee grounds, dryer sheets, scented sachets, and perfumed soaps. Place these items in burrows or near entrances to deter moles. 11. Replace your natural grass lawn with synthetic turf. If the reason you are looking up how to get rid of moles is the damage they have done to your lawn, you can easily remedy this issue. Replace your natural grass lawn with artificial grass, and moles will no longer leave mounds of dirt in the middle of your lawn. Without natural grass, beetles won’t be laying their eggs that will turn into grubs. Since you will not have to irrigate a synthetic lawn, you also will not have the moist soil that attracts earthworms, which are a food source for moles. Additionally, natural grass lawns attract lots of insects, so removing natural grass will cut down on this food source as well.